A lot of you must be wondering what kind of fantastic hardware I'm using to bring this website to you. Well here it is. 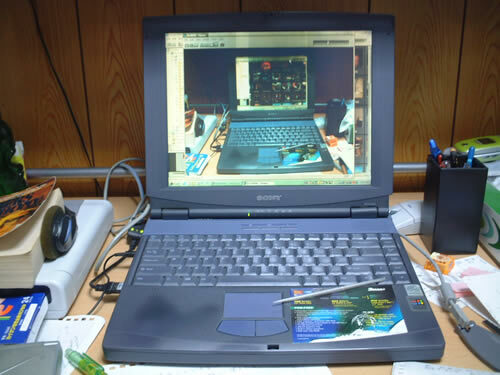 Meet my six year old Sony laptop. 32MB of RAM that has thankfully been upgraded to 160MB. A huge 4GB hard drive that's always full, and a 366 MHz processor. Problems? It crashes all the time (Windows 98), it's full of funny little viruses, and sometimes it just won't boot up until the 2nd or 3rd try. It still works though. I guess they just don't make em like they used to. 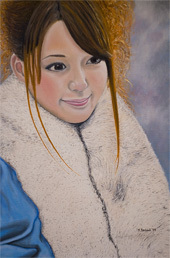 My bid to get out of teaching English and break into the Japanese job market. 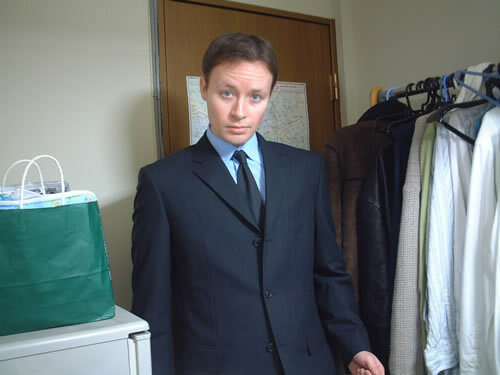 Went out and got a new suit ($300), and a new haircut ($10). 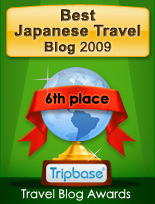 All I need now to be complete is a fluent grasp of the Japanese language, then I'll be a hot commodity! I've got a few interviews lined up so we'll see where the future takes me. It's been almost exactly a year since I bought my violin, and since then I've practiced fiddle music just about every day. 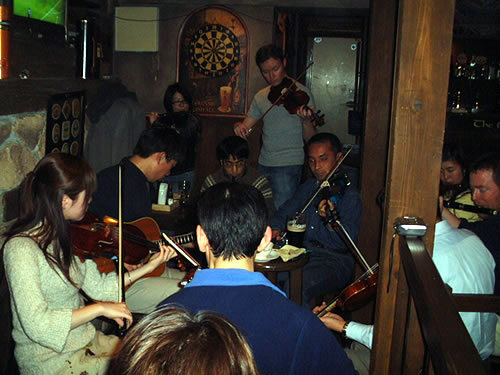 I was looking for people to play with so I joined this Irish session at Morrigan's pub in Tokyo. I thought I was getting pretty good but these guys blew me away. Still, it's a lot of fun and everyone is really nice. Organized by Kenichi Fukae (playing the guitar) this session is one of the more famous in Tokyo. I've only been twice, but both times I've met some semi-famous musicians! From left to right: John, me, Mike, Kate, Nick, Sid (dog), Rob and Elliot. Mike (from the UK) is the guy I went to Oz with, he's a fellow English teacher here in Japan. Mike's friend Nick and his girlfriend Kate spent a whole week with us showing us the sights and taking us around. Rob is the owner of the house where all these people live and Sid is his dog. John on the left is Rob's uncle and Elliot on the right is a student from Brazil also living here. Thanks all of you for everything, it was a great trip! 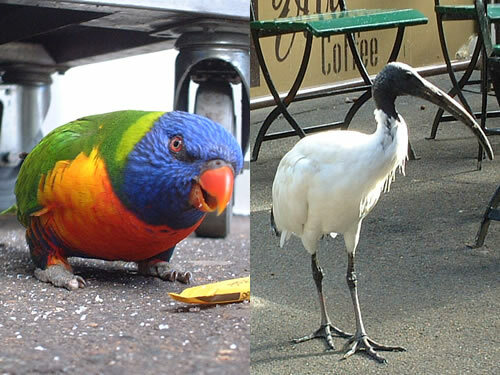 Australia is full of interesting birds. The one on the right is an Ibis and you can see lots of them just walking around parks in the city. They look kind of like cranes with their long necks and beaks, and are sometimes aggressive if get too close. You can also find some wild parrots if you're lucky. I managed to get a close up of this guy on the left eating a pack of sugar at this outdoor cafe. At first I thought they were pets of the cafe's owner until he came out and shooed them away with his hat. I expected to see kangaroos, koalas and wombats wandering the streets of Sydney, but sadly enough I saw none of these things. To make up for it, me and the guys decided to have a good ol' fashioned kangaroo barbeque. There was no koala on the shelves, but we managed to find kangaroo steaks, 'cajun' kangaroo kebabs and kangaroo sausages instead. 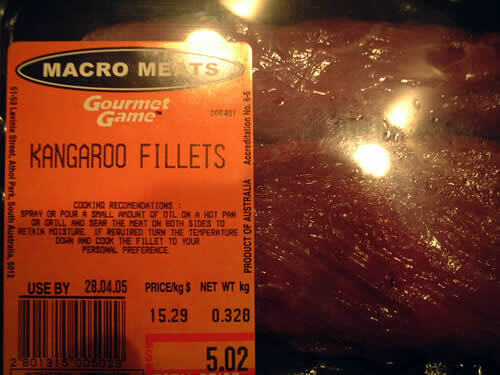 If you ask me, kangaroo looks a little like beef, it has the same colour and consistency. The taste is more gamey though, similar to venison. My life continues! There has been a bunch of new stuff going on in my life, but I've been lazy taking pictures. 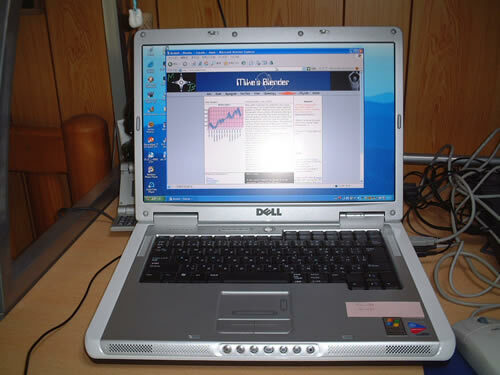 Anyway like I promised, here's my new baby, my Dell Inspiron 6000. ten times the hard drive of my old Sony, and it's about ten times faster too. Dell makes a mean computer for a very low price. How do they do it? A Sony with the same specs costs around $2000 but my Dell here was only $1200. Wow, Dell rocks! Now I'm thinking of buying another smaller one! Am I being greedy? There's this little weekly magazine called 'Tokyo Notice Board' that publishes little stories from resident foreigners here in Japan. 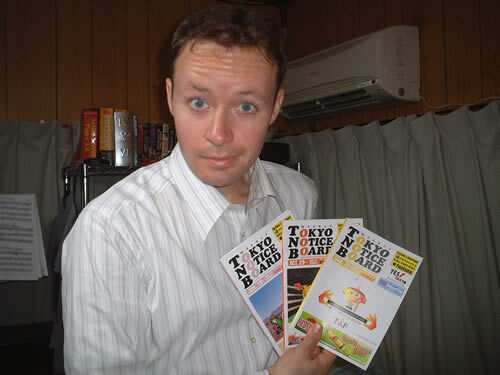 Often having nothing better to read, I pick one up (it's free) and read the drivel that other gaijin have sent in. Noticing that they pay you 3000 yen (about $35 Can.) if your story is published, I thought to myself 'I can write better crap than this', and I did, and so far my silly stories have been published 3 times, and now I'm $100 bucks richer. Neato! 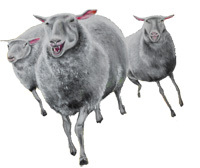 I'm crazy about Cape Breton music now and here are some of the people who agree with me. 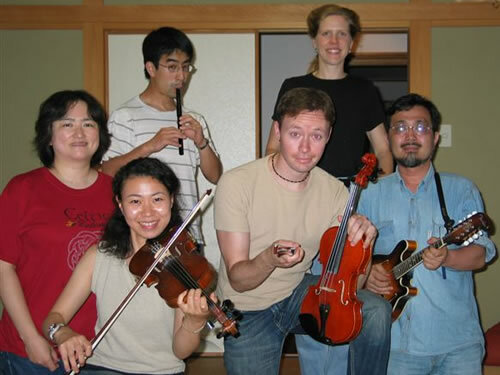 Clockwise from my left is Miho (my main fiddling buddy), Yukie (whistle), Yamada san (flute), Rebecca (fiddle), Matsuzawa san (mandolin and guitar) and of course me. Are we cool or what? This is the second time we've gathered at Rebecca's amazing, massive house in the countryside to jam, eat and drink until the wee hours of the morning. Thanks Rebecca!